It rained heavily on Sunday (14.8.2005) and hence the entire sky cleared up! Day 7 15.8.2005 CLEAR BLUE SKY!!!! YABEDABEDOOOOOOOOOOOOOO!!! NO MORE FOGGING HAZE FROM FOGGING INDONESIA!! this Van overturned due to the rain..wtf. Mat Salleh: ooooh…let me see. Then they kissed each other. All of us turned behind and saw a masked melay Guard. The Mat Salleh could speak Melay with American Accent!!! Fogging Hell!!! Then,they went on arguing with each other for a good 3-4 mins…Amazingly, their Touch n’ Go Card took that fogging long to be reloaded as well. The Clerk stared at me…. The weather makes me feel like our days are numbered. FOG YOU INDONESIA!!! FOG YOU!!!!!!!!!!!!! fog you motherfogging foggers!!!! The API in PJ & KL where xes and me stay and work in,hit 349 and 321 respectively as reported by The Star Online. The lighting of my office’s reception area make it looks like we are living in a bioharzard zone. Blurry view from the LRT…no, there is nothing wrong with the window or my camera phone. choose which one more important, you damn GOVERNMENT!!! The haze had been getting worst day by day, masks have been selling like hot cakes! This photo was taken at about 12pm. The visibility level was acceptable but the air was totally unbreathable. I felt dizzy and drowsy just standing outside there for one min. The moment my master put down the phone, the Pizza Hut man show up at the doorstep, looking as if he was gonna faint. Haze not only make people feel drowsy, some became dumber because of it. The newspaper man came to collect his fee at our office,my clerk asked him how much is the charge. and he is the boss!!! How can you forgot!!! This photo at 5pm. ooooh no, the visibiltiy so bad..i can’t see my car from the reception area. On the way back, the street lights were turn on early at LDP. The jam started early also or was it because people were driving very slowly. So slow that i even had time to take photo…or was i driving too slow…hmmmmm…? Haze can actually make a person…slow too. Posted on August 10, 2005 Author xesCategories Haze 200512 Comments on Damn that HAZE…!!! The haze in Kuala Lumpur has gone worst. The entire Kuala Lumpur stinks. Visibility is low and its boiling hot. Many people are falling sick. It hasnt rain for days as well. According to the news, the haze wont go away until end of the month October!! Soon we need to walk out with a gas mask. 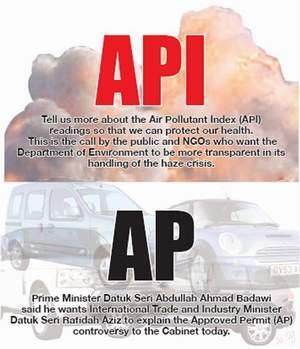 PETALING JAYA: The Air Pollutant Index (API) hit 410 in the Port Klang as at noon Wednesday. The API system as adopted in Malaysia categorises air quality as hazardous to health when the index exceeds 300, according to the Department of Environment website. All of a sudden, Kuala Lumpur was covered with thick haze this evening. Visibility was barely 10KM. I guess there’s another forest fire in Sumatra? Posted on August 2, 2005 Author xesCategories Haze 200526 Comments on Haze!!! !